We’ve shown you plenty of videos of our of our customers with their BendPak Lift. We’ve also shown you some videos that BendPak put out to promote their wide variety of products. This video is a production put out by BendPak with the popular professional wrestling personality, Bill Goldberg. 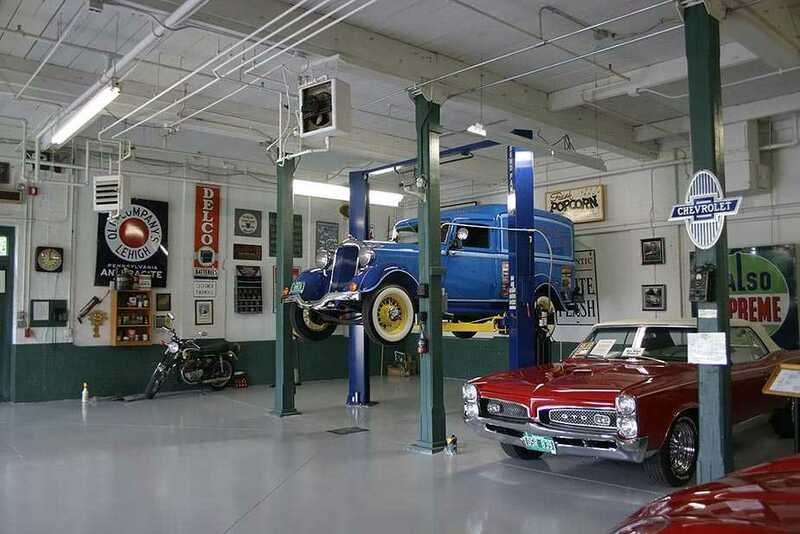 He has the ultimate garage workshop setup, with all of the latest toys from BendPak, including a four post lift and a single post parking lift for storing his many vehicles. He also has a two post lift for servicing his many cars. He compliments his auto shop with many other pieces of Bend Pak / Ranger equipment. He’s got a BendPak air compressor, Ranger tool box, Ranger motorcycle lift, and much more. Most folks can only dream of having their personal garage outfitted like this. After that, they take you to the famous Surf City Garage, a truly impressive shop, and pleasing to the eyes too. Next, they show clips from other notables who have BendPak lifts, like Jay Leno, Jessie James and West Coast Customs. Go ahead, watch the video and look on with envy. We did. Have you been considering purchasing a four post lift for your home garage? If so, we recommend the model HD-9 or HD9ST BendPak Lift. There is no finer quality four post lift on the market built for the home hobbyist. Whether you’re using it for storing one vehicle over another, or you just want to service your fleet of cars, this lift is the best choice on the market. The latest customer picture and testimonial to come in is from Joe Raymond from LTM Auto Repair out of Pontiac, MI. They purchased a BendPak Lift from us years ago, and when they were in the market for a new automotive lift recently, there was no question what they were going to get. The P6-F Pit Lift by BendPak is perfect for lube shops that have a pit for the technician to climb down into and quickly change the oil. 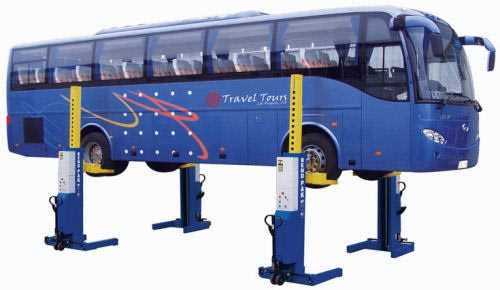 These car lifts are also perfect for tire rotations and brake work. This customer purchased the flush mount model. You would need to create a recess in your floor to make the lift flush with the surface of the floor. Bend Pak also has a model that mounts on top of the floor that makes installing much easier. There’s no better testimonial for a product or a company’s reputation that a customer that comes back for more. “The P6-F Pit Lifts have been a very useful tool for us for 11 years now. We haven’t had any trouble with the lifts other than regular wear and tear. That’s why we just purchased another one. Thanks for everything”. For customers who need to service heavy trucks, buses, fire truck and other heavy equipment, the choices are limited. You can go with a Four Post Lift, or the BendPak heavy truck Portable Column Lift. Each type of Auto Lift has it’s own strengths and weaknesses. The benefits of choosing a portable column lift instead of a four post lift are built into the name – Portable. That is a huge selling point for many customers. These things are truly heavy duty. They boast a full 16,000 lbs. per column. They are sold in sets of four or six. So you could reach a capacity 96,000 lbs. with a set of six. Lifting height maximum is 70 inches. They can be operated individually, in pairs, or all in conjunction together. Each lift column has it’s own locking mechanisms, control check valve and pressure relief valve. The hydraulic control system allows you to lower each individual column manually if necessary in the event you lose power. There is a synchronized hydraulic power system and a microprocessor controlled lifting system that assures a stable, smooth lift that won’t let you down. There are emergency stop buttons on each column in the event of an emergency. The wheel forks are adjustable and to accomodate different wheel diameters. There is a keyed lockout for security. They are portable and roll around quite easily with a pallet jack type of system. Each column has a quick connect plug for speedy set up. There is an automatic leveling system for safety. There are optional rolling jack stands available as a popular accessory each rated at 16,000 lbs as well. They have the unequalled BendPak deluxe powder-coating finish that is superior to any other out there. This assures you of longevity that you’ve come to expect from a BendPak Lift. The one thing customers need to consider is that these systems require a lot of power, so 3 phase electricity is required. We have been selling BendPak Lifts for many years now, and each type of car lift has it’s own features that make it popular and useful. Some lifts, like our two post lifts, are popular because they offer a full rise, so that you can stand up straight when working underneath them. All the while, two post lifts offer you the greatest access to the car. Several of our lifts are specialty lifts, and are made for specific purposes. Our SP-7X full rise scissor lift by BendPak offers a full 69 inches of lifting height, along with complete under-car access. People who get this lift want it for the same capabilities of the two post lift, but want it to take up less space in their garage. Then there’s the Low Rise Lift. It’s a pad lift that raises up to 29 inches. It’s great for body work, along with tire and brake work. But it won’t give you complete access to the underside of the vehicle. Then there’s the P-6 Pit Lift. It does offer complete access to the underside of the vehicle. Like the LR-60 low rise lift, it is a pad lift. Typically, it is used in lube shops to straddle the pit. These last three models have one thing in common. They are all pad style lifts. The vehicle frame rests on these pads. Usually, the distance between those pads is at the perfect distance apart to handle most typical vehicles. However, some vehicles might have jacking points that are closer together than the pads are. That is where the LR-4A arm kit comes in. The kit consists of four steel arms that grab onto the outer edge of the lift pad, and then cut across the pad, and into the space between the two pads. They can slide up and down the length of the pad, and they come with rubber lift blocks that you can adjust to meet the vehicle jacking points. Most vehicle jacking points fall within the area of the pads on the lift, but for those special situations where they don’t, the LR-4A arm kit is the accessory you need. If you get a BendPak Lift with pads, you may want to consider the LR-4A arm kit. Our BendPak PL6000X Single Post Parking Lift is a popular model for the home / hobbyist market and for parking facilities because it offers a space saving design that allows users to store one vehicle over another. It also has a small footprint and doesn’t clutter your garage floor with columns. There is just one column, so many customers prefer it’s design to the typical four post parking lift. One recent customer was out of of Potomac, MD. He actually purchased two of these handy lifts for his home garage storage solution. It was installed by one of our most reliable and capable installers, Charlie Yancey of Charlie’s Lift Service out of Catonsville, MD. He’s been in the business for many years and does quality work. We recommend customers have this particular model professionally installed. It’s quite large and bulky and cumbersome to handle, and can be more difficult to install than the typical four post parking lift. Plus, it’s vitally important that this model be mounted to the floor properly, due to it’s single column design. You’ll also want to make sure your floor is adequate. It requires 4″ of concrete at 3000 psi. 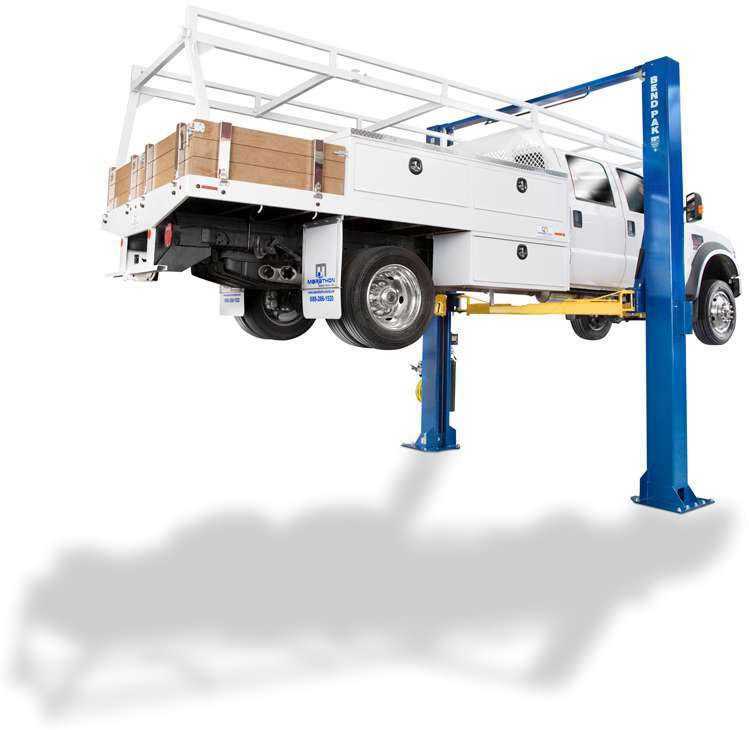 Take a look at the features to see if this popular BendPak Lift is right for you. BendPak has an engineering staff of seven full time engineers who constantly design, test, and evaluate automotive lifts. BendPak lifts have evolved and changed over the course of the past 40 years not because they had to, but because they are always improving the design and structural stability of their lifts to stay ahead of the pack. At first glance, many competitor’s Auto Lifts look “engineered”, but what happens when you look a little deeper? All BendPak Lift designs are computer modeled for structural integrity and functionality and then undergo simulated axial and applied forces, bending, and much more using top FEA programs. After the design and structural integrity is determined to be sound, they proceed with actual physical testing. How many other manufacturers are this careful about their lift designs? Answer is – not many. There is only one true national lift standard for safety and quality ‐ OSHA endorsed ANSI/ALI ALCTV‐2006. If you don’t see any reference to this standard when another lift manufacturer talks about their lifts, then ask yourself, “is saving a few extra dollars on a non certified lift really worth the loss in safety”? BendPak lifts do offer value, but more importantly, they offer peace of mind. ASEdeals.com is pleased to announce a new sale effective October 1st for a limited time. Our most popular BendPak Lift models are currently on sale and will be for a limited time. All of our XPR10 two post lift models are on sale right now at over $130 off their regular price. There is no better time to purchase one of the best two post lifts in the industry. You know when you say to yourself, “I’m waiting for the right time”? Well now is that time! You will not get a better chance to get these lifts at a lower price. We’ve got the XPR-10AC, which is the asymmetric, narrow model at $2700. Then there’s the XPR-10ACX for only $2705. This is the extra wide asymmetric lift. If you’ve got the floor space, we strongly recommend the extra wide model. It just makes life a whole lot easier opening your doors wider to get in and out of the vehicle after you’ve parked the car between the posts. It also makes it easier working around the vehicle while it’s on the lift, and it makes it easier to get at the wider vehicle jacking points too. Don’t forget, the BendPak asymmetric models have the ability to position the vehicle symmetric if you need to balance it out. It’s like having two lifts in one. BendPak does have symmetric car lift models as well. The XPR-10CX is the extra wide symmetric lift. It is currently on sale at $2700. Having a wide model when getting a symmetric lift is such a huge benefit, because symmetric lifts don’t allow you to open the doors on the car very much. The extra wide model gives you 6.5 extra inches on each side. And remember, shipping is FREE to any commercial address within the 48 states as long as it’s accessible for a freight truck. Or, for you home hobbyists who don’t have a way to unload it from the delivery truck, you can pick it up at your local freight carrier’s terminal near you, like Yellow Freight, or Conway Freight. They will load it into your truck or trailer, and then when you get it home, you can unbundle it and take it off piece by piece. Don’t let this opportunity pass you by. This sale won’t last long. Customers frequently ask us, ” How does your BendPak Lift compare to a Rotary lift”? It’s a reasonable question as a consumer. After all, Rotary is a well known car lift manufacturer with decades of experience in building lifts and a great reputation. Both manufacturers are top of the line and are ALI Certified. So when BendPak recently came out with their BendPak vs Rotary Two Post Lift Comparison, we stood up and took notice. Look, we have carried BendPak lifts for over 10 years and we know they have a great product with fantastic features and a reputation of quality and reliability. We always assumed that the BendPak lifts would be comparable to the Rotary lifts when it came to quality and features, and that BendPak would have the edge when it came to price. This guide BendPak introduced really opened our eyes. It illustrates in a very clear and concise way how the BendPak two post lifts are superior in many ways. First, it shows how the BendPak lifts are just plain heavier, beefier, and produced with thicker steel. The columns weigh dramatically more. The arms and lift carriages are also significantly stronger and more heavy duty. One look at the cables shows that they are a thicker gauge and the equalizer cable pulleys are larger diameter as well. Then take a look at the hydraulic cylinder, there’s more stroke and a flow restrictor on the BendPak cylinder. Let’s not forget about the very popular triple telescoping arms on the BendPak lift. There are too many differences to list here in this post. We urge you to take a look for yourself by clicking on the following link – BendPak vs Rotary Comparison.